A series of solutions for data analysis to help you extract useful information from statistics as much as possible. Take advantage of pie chart, column, doughnut or bar chart to do or present data analysis visually and effectively. Data Analysis is the process of systematically applying statistical and/or logical techniques to depict and demonstrate, condense and recap, and evaluate data. The purposes of data analysis are discovering useful information, suggesting conclusions, and making better decision-making. Data analysis has multiple facets and approaches among which data visualization is very effective and popular. Data visualization means information that has been abstracted in some schematic forms, such as pie, column, bar or doughnut charts, including attributes or variables for the units of information. A primary goal of data visualization is to convey information clearly and efficiently to viewers via the infographics selected, such as tables and charts. Effective visualization helps users in analyzing and reasoning about data and evidence. It makes complicated data more accessible, understandable and usable, especially for visual learners. Well-crafted data visualization helps uncover trends, realize insights, explore sources, and tell stories. Edraw is a top-notch tool for data analysis via a bunch of visualization solutions. It is unparalleled for its automatic functionality. 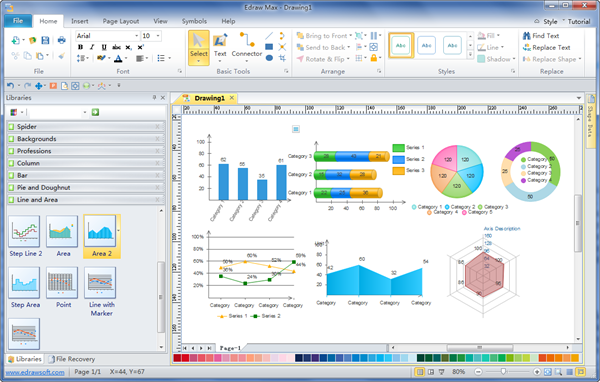 Totally 11 kinds of charts and graphs can be generated from predefined templates which contain floating action buttons. 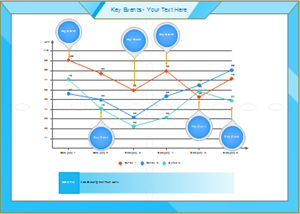 With such buttons, users can easily modify the template and quickly gain a brand new chart. What is more, after the data is changed, the shape will adjust itself automatically. 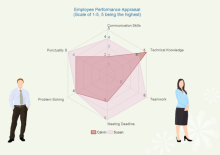 See how amazing this tool is in Charts and Graphs Solutions. 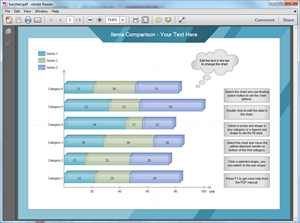 Users may have different analytical tasks, such as making comparisons or understanding causality, and the design principle of the charts or graphs follows the task. Tables are generally used where users will look-up a specific measure of a variable, while charts of various types are used to show patterns or relationships in the data for one or more variables. There are many kinds of graphs, charts or diagrams that can visualize ideas and explain numbers in an easy to understand way. Here are some examples for your reference, with some tips about how to use them. Pie Charts Used to show percentages. Limit the slices to 4-6 and contrast the most important slice either with color or by exploding the slice. View some vector pie chart examples. Column Charts Suitable for showing changes in quantity over time or comparison of different categories. It works best with 4-8 bars. Refer to some featured column chart examples. Bar Charts Good at comparing quantities. For example, comparing figures between four different countries. You may like Edraw's ready-to-use bar chart examples. Line Charts Used to demonstrate trends. For example, a simple line chart can show that the sales keep going up. The trend is good. When presenting, show an uprising arrow later to underscore the point: The future looks good! 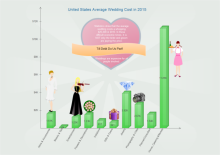 Check out some creative and attractive line graph templates. Spider Charts Provides a view of data comparison in multivariate data when there are many categories to compare. Some vector spider chart examples are available in Edraw. In Edraw, only a few steps are needed to gain characteristic infographics for data analysis. You can make the most of the well-designed examples to get started instead of starting from scratch. Click relevant link to see more detailed guide.